HONOLULU (2 Aug. 2016) Federal fishery managers will meet by teleconference and webinar tomorrow to recommend the 2017 U.S. Pacific Island territorial catch and transfer limits for bigeye tuna caught by longline in the Western and Central Pacific Ocean (WCPO). The Western Pacific Regional Fishery Management Council will also address the proposed expansion of the Papahanaumokuakea Marine National Monument and the IUCN World Conservation Congress, among other items. 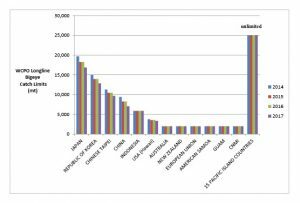 Under an international management regime, the United States has a 2017 national quota of 3,345 metric tons (mt) of longline-caught bigeye tuna in the WCPO. This is 209 mt less than the United States’ 2016 longline-caught bigeye tuna quota in the WCPO. The quota is utilized by the Hawaii-based longline fishery. The internationally developed quotas for Small Island Developing States and Participating Territories in the WCPO are unlimited. However, the Western Pacific Regional Fishery Management Council recommended and the Secretary of Commerce authorized capping each of the U.S. Pacific Island territories’ longline bigeye tuna catch at 2,000 mt and allowing the transfer of 1,000 mt per territory to federally permitted vessels. An important factor the Council will consider is the status of the bigeye stock. Also on the agenda tomorrow is the proposal by U.S. Sen. Brian Schatz (D-Hawaii) and seven Native Hawaiians to expand the size of the Papahanaumokuakea Marine National Monument (PMNM) fourfold to include virtually the entire exclusive economic zone (EEZ) of the Northwestern Hawaiian Islands, i.e., about 60 percent of the U.S. EEZ around the Hawaiian Islands. The proponents are asking President Obama to use the Antiquities Act of 1906 to authorize the expansion and close fisheries in the area. The Antiquities Act does not require a public review or socioeconomic and environmental analysis. It was established to protect objects of historic or scientific interest on federally owned and/or controlled lands. 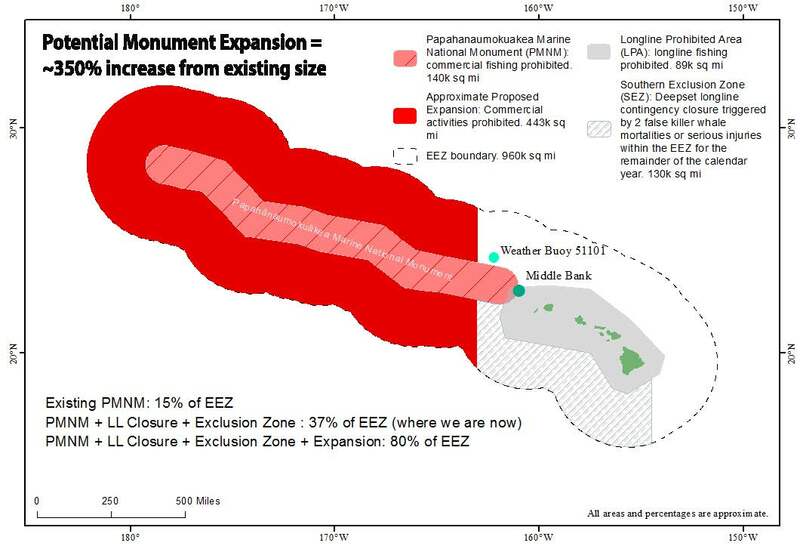 Monument expansion proponents are urging the President to announce the expansion during the IUCN World Conservation Congress to be held Sept. 1 to 10 in Honolulu. Opponents to the expansion are asking “Why the rush” on a decision that could have enormous, permanent and unintended consequences. Opponents include the commercial and non-commercial fishing communities, chefs, businesses and organizations and individuals concerned about Native Hawaiian and state rights, including former U.S. Sen. Daniel Akaka (D-Hawaii), former Hawaii Governors George Ariyoshi and Benjamin Cayetano, CNMI Gov. Ralph Torres, Hawaii Senate President Ronald Kouchi, Hawaii House Speaker Joseph Souki, 29 other Hawaii House representatives, Kauai Mayor Bernard Carvalho, the Koani Foundation, the Coalition of Hawaiian Nationals and Ke Aupuni O Hawaii, among others. U.S. Sen. Mazie Hirono (D-Hawaii) has asked for a discussion that is “transparent and inclusive of community input” “to balance protecting our environment and issues including food security and sustainability.” For more information on fisheries in the Northwestern Hawaiian Islands and concerns about the monument expansion, go to www.wpcouncil.org/nwhi-fisheries. The Western Pacific Regional Fishery Management Council was established by Congress in 1976 under the Magnuson-Stevens Fishery Conservation and Management Act. It has authority over fisheries in the Pacific Ocean seaward of the States, Commonwealth, Territories and possessions of the United States. The Council’s voting members include representatives of the local governments, fisheries and other stakeholders from the State of Hawaii, Territory of American Samoa, Territory of Guam and Commonwealth of the Northern Mariana Islands plus the regional administrator of the National Marine Fisheries Service (NMFS) Pacific Islands Regional Office. The US Coast Guard, Department of State and U.S. Fish and Wildlife Service are non-voting members on the Council. Regulatory decisions by the Council are transmitted to the Secretary of Commerce as recommendations for approval.